Sanctions against Iran are almost as old as I am. I was born in early 1980, and international sanctions against Iran began during the Iran-Iraq war of the 1980s as most global and regional powers supported Iraqi President Saddam Hussein in his invasion of the country. My father was injured and exposed to chemical weapons during that war, and as a result suffered from Parkinson's disease later in life. His health was at its worst in 2012, during an unseasonably warm summer with temperatures rising above 100 degrees. In the two years leading up to that summer, it had become increasingly difficult for Iranians to access medicine for rare and chronic illnesses because of wide-ranging sanctions against Iran. Imports of American and European medications fell by an estimated 30 percent between 2011 and 2012 alone, according to The New York Times. Although sanctions over Tehran's nuclear program did not directly target medicine or hospitals, they did restrict banking and trade, which limited financing for imports of medicine and led to limited medical supplies, making life difficult for patients. In 2012, Fatemeh Hashemi, head of the Charity Foundation for Special Diseases, a non-government organization supporting six million patients in Iran, started to speak up about the shortage of medicine in Iran for several diseases such as hemophilia, multiple sclerosis, and cancer. She even wrote to UN Secretary General Ban Ki-Moon, calling on him to intervene for the health of Iranian patients who, she said, have had "their basic human rights" taken away because of the sanctions. Despite these struggles, my family and I always managed to find my dad's medicine, which had to be imported from Europe. But as my father grew sicker that summer, his doctor recommended a new Western European medication. Although Iran produced the generic version of the same medicine, his doctor said the Iranian medicine was of lower quality and wouldn't be sufficient. That evening after work, I went to one of the special pharmacies in Tehran that supplied medicines for rare and more serious diseases. There was a long line in the street outside the pharmacy. After I waited 45 minutes in the hot sun, the pharmacy told me it didn't have the medicine my father needed. Bank sanctions and exchange rate fluctuations meant that finding foreign drugs like the one my father needed would be difficult, the pharmacist told me. "You might be able to find it on the black market instead," he said. I sat on the stairs outside the pharmacy, empty handed save for my water bottle, which had grown hot from the sun. I was afraid to try the black market because there was no guarantee that what I found would even be real or safe. My father needed that medicine, and I couldn't bear to go home knowing I wouldn't be able to find it. That night, my father slept without taking any medication. In the morning, when we saw how badly his body was shaking and that he was clearly in pain, my family realized we had no other choice: We would have to buy him the Iranian brand. My dad used that medicine for three months until a friend from Europe managed to bring the medication for him. But by then, my dad's disease had accelerated, and those three months caused him harm from which he never recovered. My father passed away from his illness in July 2016, exactly one year after the JCPOA between Iran and the P5 plus 1 powers was finalized. That agreement led to renewed hope for Iranians. Mohammad Ali Sahraei, vice president of the Multiple Sclerosis Society of Iran, was one of the many Iranians celebrating the Iran nuclear deal. Access to MS medicine would become easier after the lifting of sanctions, he said. But today, President Trump's reckless decision to withdraw from the Iran nuclear deal has once again left the lives of more than six million Iranian patients with diseases like cancer, hemophilia, and MS hanging in the balance. Before the nuclear sanctions against Iran, Mahmoudi said that she had access to whatever medicine she needed. That medicine suddenly became scarce after sanctions, forcing her to use lower quality Iranian brands. "After the Iran deal, I had access to Western brand medicine and the psychological stress and pressure was reduced," Mahmoudi said in a phone interview from Tehran. But Trump's decision to pull out of the Iran nuclear deal is causing new stress for her and her family. 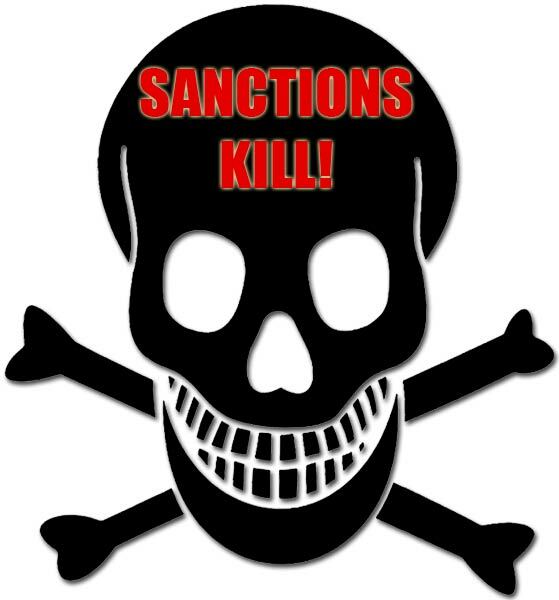 "The sanctions have a direct impact on my life and health," she told me. "I'm worried." About the author: Fariba Pajooh is an Iranian journalist who has been reporting on Afghanistan, Iran, and the Middle East for over 15 years. She graduated from Medill School at Northwestern University and has written for Iran's Shargh newspaper as well as PBS Newshour, Buzzfeed, NPR, and other outlets.